Have you heard the story of the guy who traded a paper clip for a house? I'm not kidding. It took him almost a year and 14 trades to get there, but he managed to trade up in value from one red paper clip to a two story farm house! It's rated at 12 volts DC. I verified that a 9 volt battery will run it (borrowed one from a smoke alarm for a few minutes :-). It has 3 wires. Connecting the battery the right direction to the middle wire and either of the outside wires makes the fan spin. I'd imagine connecting both wires and/or using higher voltage would make it spin faster. I put the mounting screws back in, so if you want to attach it to something, you won't need to hunt for the right size screws. 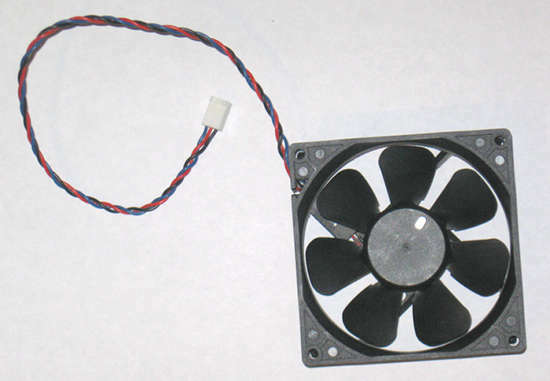 So, what would you trade for this lovely computer case cooling fan and 4 mounting screws that would move this Trade-Up toward the goal of a Xoom an ASUS TF700T tablet? I'll post pictures of whatever I get here so you can track my progress...and keep an eye open for something you want to trade for :-). Antone, good luck with this trade-up. With the right amount of commitment, you may just pull it off. That said, I know of at least one superb Motorola Xoom tablet you won't be getting your hands on!